My friend Christine has kindly agreed to write a series of posts on her experiences with buying a home for the first time which will be posted occasionally. See Part 1 – First Steps and Pre-Approved Mortgages. Remember that a mortgage is a fancy term for a loan; however, it is a loan that is secured against the value of your home itself. The original amount that is borrowed is referred to as the principal. A conventional mortgage requires a downpayment of at least 20% the purchase price of a home. First time home buyers can take advantage of the federal government HBP (Home Buyers’ Plan) whereby an individual is allowed to withdraw up to $20,000.00 from his/her RRSPs. Minimum repayments of 1/15th of the loan are required each year, with the full amount to be repaid within 15 years. You are essentially loaning yourself the money for a home purchase. 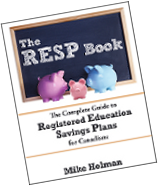 The downside is that the withdrawn money would be not be appreciating in your RRSP. If you do not have 20% down, what are your options? When a mortgage is taken out on more than 80% of a house’s cost, then it is known as a high-ratio mortgage and lenders require mortgage insurance to protect themselves in case of default. The insurance is required on the full mortgage and is either paid upfront or added to the mortgage itself. Mortgage insurance is charged on the full principal mortgage. The calculation is based on the percentage of the mortgage compared to the total purchase price. CHMC (Canadian Mortgage and Housing Corporation) and Genworth Financial Canada are the two institutions which provide mortgage insurance in Canada. Mortgage insurance premiums are available here. $350,000 mortgage x 2% (the rate for a loan 87.5% of the house value) = $7,000. My husband and I decided to avoid taking out a high ratio mortgage and will be using a line of credit to top up our downpayment to reach 20%. We were leery of the compounding interest on a higher mortgage. As good savers, we are confident of paying off a line of credit quickly, so the borrowing cost will actually decrease as the loan is paid off. The lowest lending rate is only one of the considerations for a mortgage. These other variables will be discussed below and vary by bank or lending institution. Fixed or Variable Rate — A fixed rate is a set lending rate for a specified period of time with fixed payments. A variable rate changes on a monthly basis against the prime rate. Therefore, while your payments remain the same, the amount that goes towards the principal loan versus interest changes. Although historically, variable rates have saved money, it is a guess which direction rates will go in the next few years. Therefore, which route you go depends on your comfort level in terms of risk. Open or Closed – Open mortgages allow you to repay the entire mortgage or make extra payments without penalty fees. Some closed mortgages charge a fee for extra payments, while other closed mortgages require that you wait until the end of the term. The degree of “openness” on a mortgage varies between institutions. If you wish to pay down a mortgage faster and will have extra funds for payments, you may not want to choose a completely closed mortgage. Term – The length of a mortgage agreement can last from 6 months to 10 years. Short-term mortgages run for two years or less and are advantageous for borrowers who think that rates will be decreasing in the next few years. After the end of a term, a new mortgage can be negotiated with a different lender. Amortization period – A period of 15 to 40 years can be chosen. The length of time that you choose to pay back your mortgage will affect the size of your payments and the amount of interest that you will eventually pay. Payment Schedule – The frequency of payments (monthly, weekly, bi-weekly, etc.) against your mortgage will vary between financial institutions. Because interest is compounded monthly, making weekly payments will more quickly reduce your principal mortgage than paying on a monthly basis, even if the overall size of the monthly payment is the same. Pre-payment Options – Essentially extra payments against the mortgage free of penalty fees, the terms and amount vary between lenders. As with a more frequent payment schedule, pre-payments help reduce the principal and the overall interest borrowing cost. Read the next post in this series “Choosing a Realtor“. Great primer on mortgages! I flip-flop on the idea of how important it is to avoid CMHC fees. As Canadians we all seem very risk-adverse and the idea of a bigger debt plus a surcharge on the purchase seems to really bother us (I’ve never done a high-ratio mortgage and would be reluctant to do so). On the other hand, if we can afford the payments, its a reasonable house for our income (we’re not buying something way beyond our means) and it would take years to accumulate the 20%, it *may* be reasonable to bite the bullet and pay the extra fees if it’d get someone into their house sooner (although the counter argument would probably be, if the house is within their means, why haven’t they been able to accumulate the 20% down?). Two notes/questions here. First, as far as I know the interest in compounded monthly only for variable-rate mortgages. The fixed-rate compound bi-annually. Second, even if the compounding is monthly, how does it matter if you make the payments weekly? I was under the impression that it makes no difference, since it’s all calculated at the end of the month. Am I right, or wrong? Vasile – I believe the weekly payments only make a difference if you are paying more than your monthly payment ie if you take the monthly payment and divide by four and pay that amount weekly then you will actually be making extra payments which will reduce the mortgage quicker. What would you do if interest rates would go up say 3-4 % ? Hwo big would be your installment ? But later you added: “I believe the weekly payments only make a difference if you are paying more than your monthly payment ie if you take the monthly payment and divide by four and pay that amount weekly then you will actually be making extra payments which will reduce the mortgage quicker”. So in the second case you are making 4 _extra_ payments per year, and the “overall size of the monthly payments” is not the same. There will be months with 4 weekly installments, and 4 months with 5 weekly installments. Do I read it right? Vasile – I think the statement in the original post was incorrect. I don’t think the frequency of payment really matters if the total payment/period remains the same – so you are absolutely correct.